Our beautiful Sanctuary offers exceptional acoustics and natural lighting to create a serene, elegant, and gracious atmosphere for spiritual reflection. Planning Your Wedding… Traditional, Interfaith, Secular? Pastors’ Steve Harms and Elizabeth Chandler Felts are available to answer your questions and to help you plan this commemorative occasion. They will help you prepare a ceremony that fits your distinctive needs. If you prefer using your own officiate, our pastor will work with you to develop the celebration you desire. Our goal is to ensure everyone communicates effectively. We are able to address and resolve any conflicts that may arise over family dynamics. Our Music Director, Gary Sponholtz, works with all genres for piano and organ and collaborates with the finest Bay Area soloists and ensembles. With excellent acoustics and a state-of-the-art sound system, you can create the desired mood for your wedding and reception. Where to have Your Wedding Reception? Our Gathering Hall is an ideal place to hold your wedding reception. It seats 80 people comfortably. We also offer a fully-equipped kitchen where caterers can prepare your ideal venue with beer and wine permitted. Our wedding coordinator will work with you and your hired professionals to ensure a smooth rehearsal, ceremony and church reception. The fee for a wedding at Peace Lutheran Church is $1,700. This includes the use of the sanctuary and church grounds for the rehearsal and ceremony, up to three planning/counseling sessions with the pastor, and the services of our church musician and our wedding coordinator. 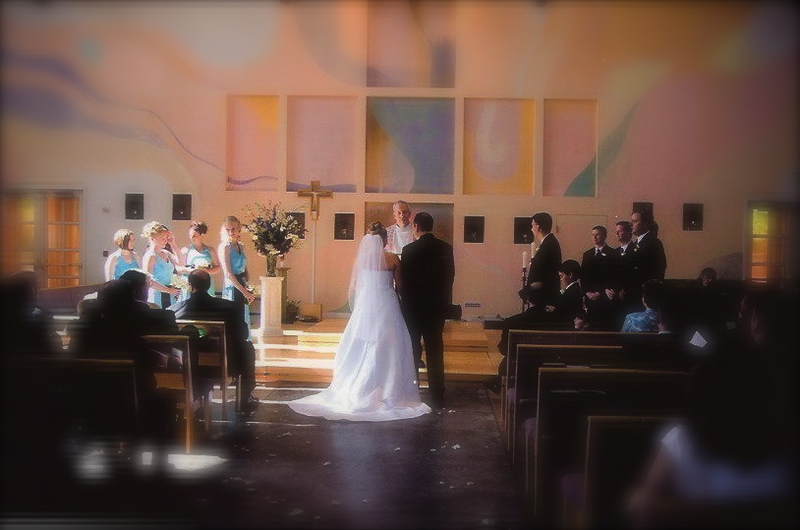 The fee for a wedding reception at the church starts at $400 and includes the use of the Gathering Hall and kitchen and the assistance of the wedding coordinator. (Reception fees do not include food, beverage, supplies or servers.) The church staff can quote a final fee based on your individual needs. Your non-refundable deposit of $425 will confirm your wedding and rehearsal dates. If you also wish to hold your reception at the church, the deposit will be 25% of the total fee. The balance is due one month prior to your wedding date.